I was on the website and ive found a picture of my mum. Its on the Queen Mary street primary 1956. We were wondering if we could get a copy of the photo as she does not have any old school photo's. I seen on the site that donations are welcome, do you accept donations for photo's or do we have to purchase. Im not really sure how your site works. Would be grateful for any help. Her name is Isobel Irvine nee McKechnie. She said the school was moved to dalmarnock primary at some point too, she went on to John Street Senior sec after that. 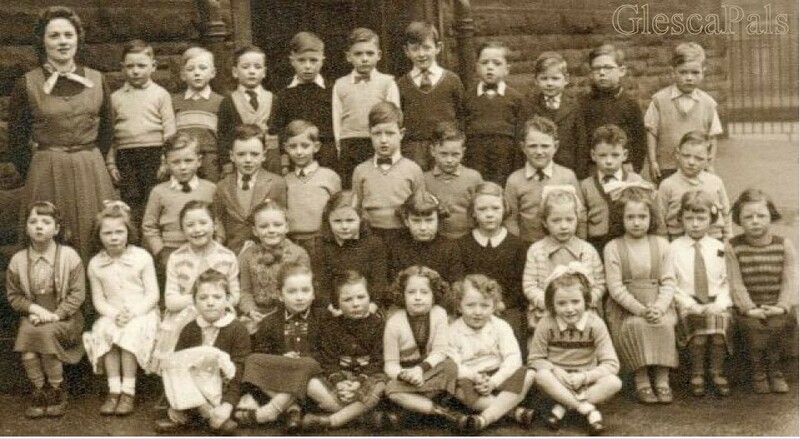 fantastic site brings back all the memories Ive seen myself and my best pal Robert Grier (deceased) 27 years now in a photograph 1956 Queen Mary st school the year I became the proud owner of a Davy Crocket hat there we are 6 years old and not a worry in the world. I think Teacher was Miss Richmonds may well be wrong but looking at that photo that name comes to mind she was great. Thats me 3RD ROW 5 along and 6 along is Robert Grier I think that also on 3rd row 3 along is William McKnight top row 7 along is William Montgomery other names i remember from that time may well be in this picture for they were in my class then and later on at Dalmarnock school till 1961 and then on to Bernard street school in 62 Wullie McNay James Kean, James Wilson, Ralph Russell, Mary Martin, Helen McTear, Helen Chalmers, John McBride, John Gibson hope this is of some help to others. Hello, I wonder if you could put a name to me in the photo of Queen Mary Street School of the Class of 1956. I am on the second row and third from the right. At that time my name was Margaret Ross.